While YouTube is no doubt one of the most popular video sharing services on the Internet, it does not necessarily mean that it is the right service for you. Determining how your content will be shared online is an important decision to make, especially as your content becomes more popular. While YouTube is a good platform to start creating basic video content, it may not offer all of the features that you desire as you begin to produce more videos and plan to better monetize your content. Because of this need for a tool with a more robust feature set, competitors to YouTube have gained in popularity over the past few years. One of these competitors is TikiLIVE. In this article, we will discuss some of the differences between TikiLIVE and YouTube and why we think TikiLIVE could be the perfect tool to take your video content to the next level. YouTube is no doubt the largest streaming platform in the world. Because of this fact, it has been reported that over 100 hours of content is uploaded to YouTube every single hour. While some of this content is high quality, much of it is not. By using YouTube as a platform you are positioning yourself alongside content that could be deemed offensive or even spammy. If you are looking to build a professional image online, you may want to look at a paid service like TikiLIVE that offers much more flexibility. One of the biggest downfalls of YouTube, especially for businesses, is their advertising methods. When users are searching for videos related to your content on YouTube, they are presented with likely thousands of options. Even if you are able to persuade your users to click on your videos, they will be bombarded with advertisements during the playing of your content. This means that before your video even starts your viewers could be taken to a completely different video or website online. This can be detrimental to your brand and is one of the primary reasons people look elsewhere for video hosting. Providers like TikiLIVE allow you to completely control what advertisements, if any are placed within your ads. This gives you ultimate control over your content. While everyone loves something that is free, you sometimes get what you pay for, especially when it comes to online services. To effectively be able to provide free video hosting, YouTube must supplement advertisements throughout your content, which obviously detracts from your brand message. With a provider like TikiLIVE, you are utilizing a service that puts your needs above all else. Because you are a premium content creator, we offer high level tools and features, which simply can’t be provided by a service like YouTube. If you have issues with your content on YouTube, your support options are somewhat limited. You likely can send an email to a support address hoping that your request will be handled quickly. This is essentially where your support options end. If you have a pressing issue that is causing problems with your videos that you need fixed now, you may be out of luck. TikiLIVE offers a much different support experience to our customers. We offer email, phone as well as chat support. We also offer a robust knowledgebase that covers many of the questions that we have been asked over the past few years. Many of the answers to your questions can be answered simply by searching our knowledgebase. IPTV offers users a way to stream their content to a user’s living room television. While some hardware providers like Apple and Roku may offer features that allow users to search for YouTube videos, if you are looking for a branded option for your video content, you are out of luck. With TikiLIVE you can actually create a branded IPTV network that your users will love. Think about creating an IPTV network with your own look and feel – not the look of a service like YouTube. Let your creativity blossom with your own IPTV network. 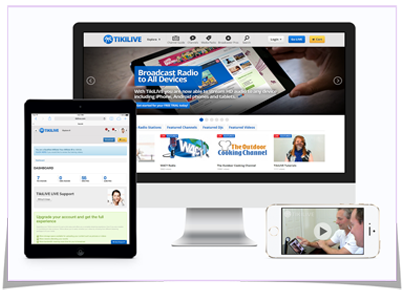 Not only do you have the ability to brand your own IPTV network with TikiLIVE, but you can also brand your website where viewers can access your content. TikiLIVE offers full integration with WordPress to give you your very own website where you can easily share your streamed content. This allows you to not only produce high quality content, but also to create your own website to begin to promote this content. Another common problem with YouTube videos is buffering or speed issues. This is because of the huge number of videos that are being uploaded to YouTube at any given time as well as the large number of people who are viewing videos on the YouTube network. With a service like TikiLIVE, you do not have to worry about these common streaming issues. TikiLIVE has invested heavily in our server infrastructure to ensure that your videos are always served efficiently with limited buffering. As your content becomes more popular, it is even more important that your videos load quickly to prevent your users from going elsewhere for video content. The typical Internet user does not have much patience when it comes to slow websites or videos. 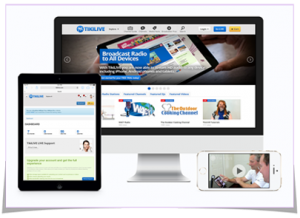 At TikiLIVE, we have absolutely nothing against YouTube, but we do feel that we can provide a superior service to individuals or organizations who are looking for a bit more when it comes to their live streaming provider. If you would like more information about our different service plans or want to test out our stellar customer service acumen, give us a call today at 305-289-4557, contact us via our support form or start a chat with one of our representatives. We look forward to working with you in the future and are confident that we can provide you with a service that will allow you to easily showcase your video content to the masses.